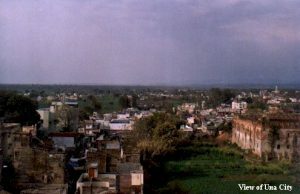 The town of Una which happens to be the district headquarter is situated by the side of Swan river which is the tributary of the Sutlej river. As per a belief prevalent in the area the great rishi Balmiki had named this river as “Som Bhadra” in Ramayana while Rig Veda had mentioned it is “Swastu”. Una had been mentioned as a state of Jalandhar Doab in “Aainey Akbari” a historical treatise of Mughal period having in its fold eight revenue mohals out of the 60 recorded in the said book. Una besides being the district headquarter, owes its importance to being the residence of a branch of the Bedi family whose ancestor Baba Kaladhari, a descendant of Guru Nanak, during the time of tenth Sikh Guru Gobind Singh after wondering about the Jalandhar Doab for some years, finally settled down here as he attracted a crowd of followers who flocked to hear his eloquent discourse on the holy Guru Granth Sahib. Even today the descendants of Baba Kaladhari are putting up in the fort of Una. The golden dome of the mausoleum of Bedi Sahib Singh situated on a high terrace overlooks the valley. After becoming the district headquarter Una town has seen tremendous expansion besides commercial and trade activities. Situated near the holy abode of Goddess Chintpurni, about 62 kms. 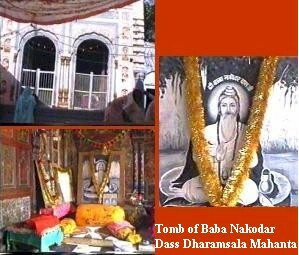 from Una, Dharamshala Mahanta is a “matha”(priory) established by a solitarian Baba Nakodar Dass during the reign of Mughal Emperor Akbar. Baba Nakodar Dass who was a ‘Panchdevaupaska’ gave the pride of place to the worship of lord Vishnu. Miss Mira Seth in her book “WALL PAINTINGS OF THE WESTERN HIMALAYAS” states “ ’Mahanta’ Lakshmi Dhar the father of the present mahanta who died few years back has a ‘sanad’(grant) which is believed to have been given to his predecessors by emperor Aurangzeb in the ninth year of his reign, corresponding to A.D. 1667 .” A large number of devotees visiting Goddess Chintpurni visit Dharamshala Mahanta to pay their obeisance. A part from its historicity and religious importance Dharamshala Mahanta is known for its murals/wall paintings. There are two buildings of note. The style of paintings in one is entirely different from that of the other. The best and earliest paintings are found in what is known as the ‘baithak’ which happens to be the sitting room (6m X 4.75m) of one building. According to Mahanta Lakshami Dhar, the paintings were executed by a ‘mistri’(mason) in his grand father’s time, which would place them at about the end of the nineteenth century. Although most of the paintings have disintegrated but those which remain have a graceful charm of their own. The other building in the ‘matha’ is a small temple, the walls of which are also covered by wall paintings but having a clear impress of folk art on these paintings. But in comparison to the lyrically graceful wall paintings of the ‘baithak’ these murals are somewhat crude thus indicating that these are of a later origin. An ardent art-lover or a chance visitor having aesthetic sense immediately seeing the wall paintings of Dharamshala Mahanta realizes that these murals which depict the rich cultural heritage of the past are loosing its luster and richness of colors as the ravages of time are taking its toll very rapidly and the time is not far away when these will become almost non-existent. On Hoshiarpur-Dharmsala road, near Gagret on the bank of river Swan (Sombhadra) is located the SHIV BARI which is believed to have been the practicing range for archery pupils of Guru Dronacharya. As per a belief the lord Shiva’s temple in the Shiv Bari was got constructed by Guru Dronacharya to facilitate his daughter Jayati to worship lord Shiva. Thousands of people from the nearly area visit Shiva temple to offer bouquets to the Shiva linga during the months of July/August.Click To Enlarge There is a very thick forest around the temple but for burning the dead, no piece of wood from the forest can be used for another purpose. What to talk of night, people do not dare to enter into the forest even in day time. Around Shiv Bari is the industrial focal point Gagret where quite a few industries have been located. Gagret is also the headquarters of a development block of the same name. Another important fair being held near Una, the district headquarters, is the fair of Pir Nigaha. The shrine of Pir Nigaha is situated in Basoli village which is about eight kms. from Una. A cavern hewn out of the solid rock said to be initially the handiwork of some ‘pandas’ and appropriated later on by the Muhammadons, had shot up to fame in the past few years. Earlier a fair used to be held on each Thursday in ‘Vikrami month Jeth’ when people brought cattle to be cured of evil sight and diseases. But now every Thursday and especially the first of the month i.e. ‘Jetha Virvaar’ draws a large crowd even from the adjoining state of Punjab. The local Panchayat under the able guidance of District Administration is trying to provide more and more facilities to the devotees/pilgrims visiting the shrine. 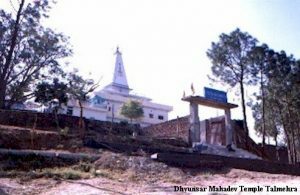 Situated in Bahi village near Talmehra in Bangana Tehsil of Una district, Dhyunsar Mahadev Temple is corrupted form of DHAUMYESHWAR SADASHIV TIRATH (Temple). It is believed that ‘kul-purohit’ (family priest) of Pandavas DHAUMYA RISHI while wandering came to this place and attracted by its serenity and beautiful surroundings, sat in reverence to worship lord Mahadev. The rishi prayed lord Shiva to bless him with the boon that whosoever will worship him at this place, his desires will be fulfilled. Eversince that time this place got the name of Dhaumyeshwar Sadashiv Tirath which got corrupted to Dhyunsar Mahadev in the modern times. 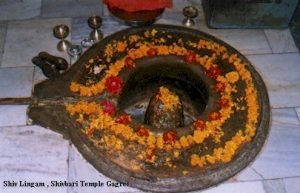 Click To EnlargeOn the auspicious occasion of ‘Shivratri’, a fair is held here when the ‘shiv linga’ in the temple is bathed with milk and butter milk in the presence of a mammoth gathering chanting “Om Namah Shivaye”. More than fifty years back, Swami Anand Giri came from Uttarkashi and renovated the badly damaged and dilapidated temple into a beautiful place. In the meanwhile some ‘serais’ (resting places) have come up and a water tank has also been constructed so as to facilitate the devotees and the pilgrims. The one time seat of Jaswan state, Amb is situated on Dharamsala-Una-Chandigarh road, about 32 kms. from Una. In the good old days it was known for its gardens of Jaswal rajas. Amb was raised to the status of Sub-divisional headquarter after the reorganization of the districts in 1972. As the buses coming from Hoshiarpur to Hamirpur, Chandigarh-Una-Amb-Nadaun-Jawalamukhi and from Kangra-Chandigarh-Delhi and Talwara-Mubarikpur-Una pass through Amb, so it is an important town. There is a Govt. Degree College at Amb. People of the area are eagerly awaiting that day when Amb will be on the proposed Una-Talwara-Mukerian rail link which will definitely go a long way in opening the new vistas of economic development.